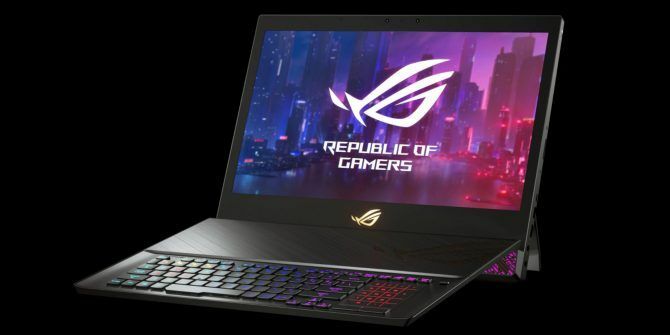 When you think about 2-in-1 laptops, you probably don’t imagine a 17.3-inch monster with high-end gaming specs, but that’s exactly what the ASUS ROG Mothership GZ700GX is. Unlike other convertible laptops, which tend to aim at buyers looking for ultra-light devices, this one is actually designed to be a gaming desktop replacement with a detachable 2-in-1 design. Everything about this laptop is high-end. Starting at the top, it comes with a 17.3-inch G-Sync display with a maximum refresh rate of 144 Hz. That screen is powered by GeForce RTX 2080 graphics technology with 8 GB of GDDR6 memory that’ll handle anything a PC gamer could want to throw at it. In the processor department, there’s the latest overclockable Core i9-8950HK processor. That will feature up 4.3 GHz of processing power when all six cores are activated. ASUS has designed a special cooling system that features four large heatsinks that’ll help keep this monster of a portable computer running as cool as possible. Obviously, with that kind of power packed into such a small space, there’s bound to be some serious heat built up, but hopefully, this specially-designed system will keep things running cool enough. Of course, the system is customizable in terms of things like RAM and the amount of storage. Buyers can elect to get as much as 64 GB of RAM in their system, and there’s support for up to four PCIe 3.0 SSDs. While this is technically a laptop, it’s really more like an all-in-one desktop, because it’s actually quite large. It comes in at 16.14 × 12.6 × 1.17 inches. It also weighs in at a whopping 10.36 pounds, meaning it’s something you’re not going to want to carry around in a backpack for any serious length of time. ASUS hasn’t announced an exact release date for its upcoming desktop replacement, but it has said that it will hit the market in the second quarter of 2019. Unfortunately, ASUS has not announced the final list of configurations that will be available, nor has the company announced how much one of these will cost, but we’d expect even the base model to sell for a pretty penny when you consider how powerful the device is relative to its size. If you can’t wait, check out this gaming computer you can get build right now This Cheap Gaming Computer Build Runs Fortnite and Minecraft Like Butter This Cheap Gaming Computer Build Runs Fortnite and Minecraft Like Butter Want to build a gaming PC on a budget to play PUBG, Minecraft, and Fortnite? Try this build for the ultimate cheap gaming PC! Read More and get to playing! Sure, it won’t rival the specs of this new ASUS, but it’ll run Fortnite perfectly! Explore more about: Laptop, .